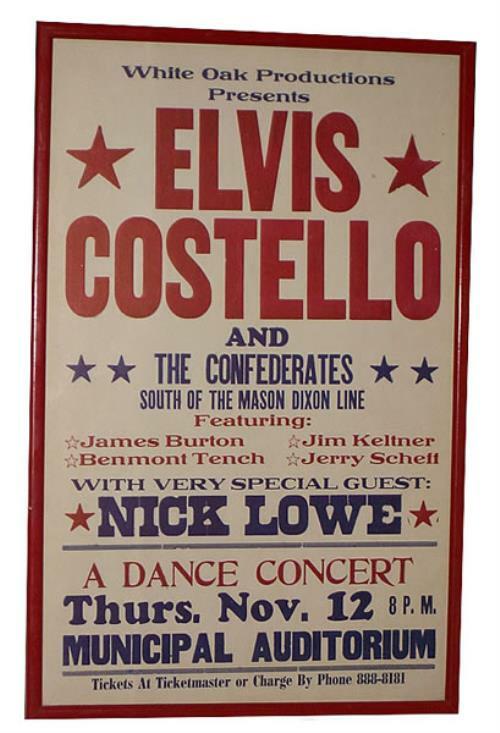 ELVIS COSTELLO & THE CONFEDERATES Framed Concert Poster (Original US concert poster for the 12th November 1987 show at the Municipal Auditorium in New Orleans, with special guest Nick Lowe. The poster has a white background with large red 'ElvisCostello' text at the top with 'And The Confederates' smaller blue text bellow, all the other gig details text at the bottom is in blue & red. This great original poster has been framed in a red wooden frame & glazed and is ready for display, measures 14�" x 23" in size).